Ajax boss, Erik ten Hag has confirmed that the Dutch club is 'doing everything' to bring back Manchester United defender Daley Blind, according to Mirror Football. The Dutchman has been linked out of Old Trafford this summer after failing to nail down a regular place in Jose Mourinho's starting line-up last season. Despite admitting the chase, Erik ten Hag has said that it still remains unclear if the transfer can be completed. United signed the player from Ajax in 2014 for £13.8m under former boss Louis van Gaal. This was after a brilliant performance for Holland at the 2014 World Cup in Brazil. Blind who can also play as a midfielder started very well for United but is not Mourinho's favourite defender. The Portuguese favours the likes of Phil Jones, Chris Smalling, and Eric Bailly in central defence over Blind. 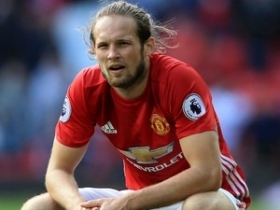 Blind made only four Premier League appearances for Manchester United last season as they finished the league in second place.